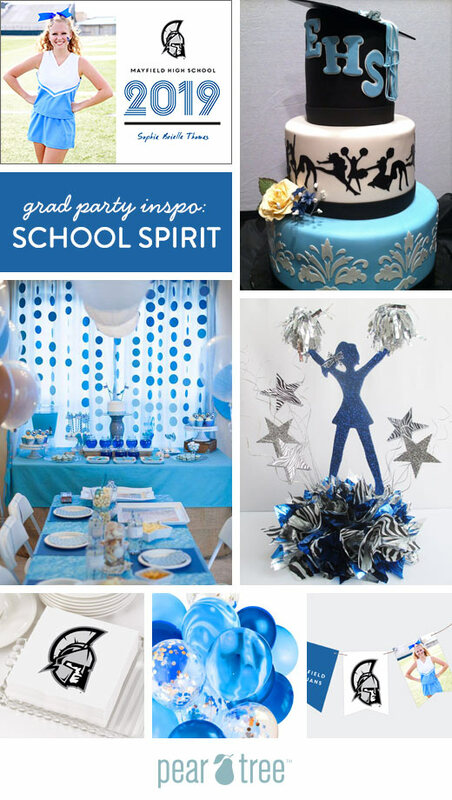 Three cheers for a graduation party that’s all about school spirit! We’ve gathered some ideas that shout school pride in a big way, and we’re positive the graduate will love them all. Some graduates simply have to have announcements that rise to their level of school spirit, and School Logo Graduation Announcements from Pear Tree do that and more! You get to choose design and background colors to coordinate with your school colors for a look that’s spot-on perfect. We’ve chosen the School Pride Graduation Announcement to go with this graduation party because of its large photo on the front with room for a school logo or mascot. The back features multiple photos with plenty of room for graduation details. Go all out with the party decorations and make sure the grad’s school colors are there to represent! We LOVE the dessert and punch table shown with circle garland as the backdrop, matching tablecloth and even food and beverages that match! Throw in some extra flair like the cheerleader centerpiece and plenty of balloons because nothing screams graduation party like balloons in school colors. The thing that every graduation party needs to step up its game is more personalization! Your grad is a unique individual and the party should be a representation of who they are after this incredible journey. We always suggest Custom Party Napkins for graduation parties because they’re useful, affordable and they look amazing! We also suggest Graduation Bunting Banners because they’re incredibly easy to use no matter the party space and they will really kick up the décor.